Our finest pocket aneroid, the 700 is the instrument of choice for the discriminating professional. Our specially designed Bariatric Adcuff™ designed for use with most manual sphygmomanometers. Our new Bariatric cuff provides a cost effective solution to the challenges of measuring blood pressure on severely obese or bariatric patients. In many cases large adult cuffs are too small, while thigh cuffs are too wide to fit on the upper arm on all but the tallest patients. Measurement is further complicated by the conical shape of a bariatric patient’s upper arm, making it virtually impossible to obtain a proper fit. One solution - measurement on the forearm is tricky at best and many practitioners don’t have the training or experience with this technique. 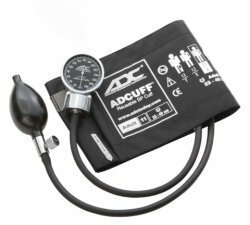 The Bariatric Adcuff™ solves all of these problems by allowing manual measurement on the upper arm in patients with a limb circumference from 44-66cm. The Bariatric Adcuff™ provides the limb range of our thigh cuff with the narrower width of our large adult cuff. Its radically curved shape allows for a snug fit on even the most conically shaped upper arms. Curved design provides a better fit on conically shaped bariatric arms. Fits limbs with a circumference of 44cm to 66cm.